Oh, and if you’re wondering why the current merchandise is somewhat Dimitri-centric, it’s because he’s charming, and I played with many designs and ideas and these were the best! Hmm… so we go from a planet named after the dirt to a planet named after dust. Maybe it’s not so bad. @Chris, he is, isn’t he? That merchanise looks fantastic! Wish I had money. Also, I see even highly-advanced aliens haven’t gotten rid of that horrible thing. Is the G.O.B. confident it can deal with an Earth that denies Dustin’s authority, and can Earth defend itself against the G.O.B.’s “enforcement” of the terms? In the meantime, we can be sure that the GOB is pulling all that material out of Uranus with all the caution and care needed to conserve and preserve Uranus’ natural beauty, structure, and orbital stability. oh the sweet smell of Spacetrawler Merch 😀 . Can’t wait to get my hands on the mug and shirt. Meanwhile Dustin reading that speech off a teleprompter I wonder what interegation bot thingy they put him through first. the putz. @McGee, I think they started by threatening to take away his vegemite if he didn’t talk. It could be worse — he could have tried muscling in on Dimitri’s monopoly on Russian Tea Cookies. Speaking of which, is that recipe for sale on your site, too? 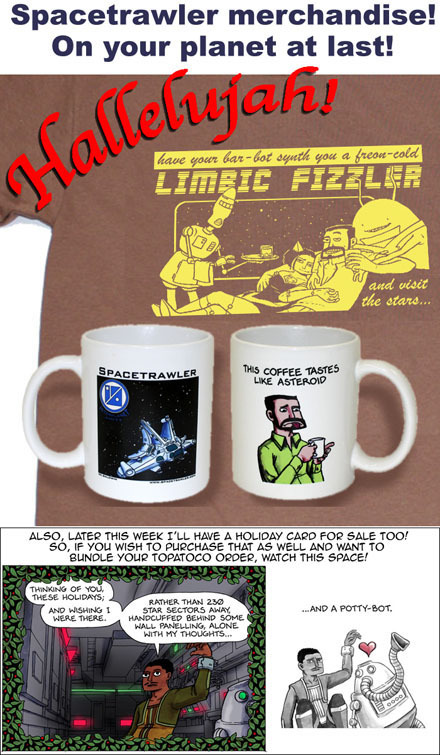 Wait a second: Spacetrawler merchandise where Dimitri is gettting it on with Yuri? And where Dimitri is drinking — GASP — coffee? To take a line from a Dr. Who episode, “Contact has been made” and the GOB will not be contacting any of our planet’s rulers or UN.